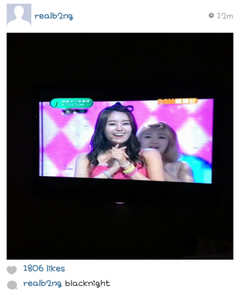 B.A.P’s Bang Yongguk Deletes Picture of SECRET’s Jieun on Instagram! Immature Fans Attacks! Well, not literally, but I think words is a form of an attack method. But what was his reason for deleting the picture? What did the fans say in the comment section? All I can say here is that this just segway into a deeper topic. Guys, you know that I know all things B.A.P, right? So, this is somewhat old news to me (2-3 day old news), but some may not know what’s going on and I’m here to explain the issue. So, Bang has an instagram account (@realb2ng. Sorry cannot link you because it’s for smartphones.) and he likes to post artwork and rarely post selcas. This time he decided to post a picture of Jieun and titling it “Blacknight.” Here’s the picture if you haven’t seen it. Well, he kind of didn’t fire back, but it’s something. I mean not on the level of Jaejoong and HongKi, but Bang is apart of a rookie group so what do you expect. Though, him commenting on the photo didn’t do him any justice. If you comment good things and don’t get a response back from Bang, what comments do you think fans made? Correct bad ones, though there were some that was trying to control the situation, but Bang ended up deleting the photo anyway. Bang can post whatever picture he likes. If it’s a picture of Jieun then so be it. I think this is a lot of controversy because a lot of fans paired them up together and posting that picture fans think there’s something up between the two. Okay, I understand that, but to act ignorant in the comments to the point where he has to delete it is unacceptable. If he goes out with her then he goes out with her. There’s nothing we can do about it. Now, I have a solution to reduce the amount of immature fans and that’s for idols to be truthful. If you are not going to date a fan then don’t give them false hope. I understand that’s to increase your fanbase and bring in profit, but that also increase immature (heck even sasaeng) fans. For example, when a MC from a show ask, “What’s your ideal type?” that’s giving FALSE hope to girls. I think that question is the main one that gives false hope to fans. But I’m not ENTIRELY blaming the idols and MCs because we (fans) have to distinguish the fact that none of us is going to date them. PERIOD. I’m not saying that it’s impossible because it is possible for a fan to date an idol, but that mean that God must wanted you to date him. Seriously, the big man upstairs thinks that you would be the perfect match for that man. Let me stop this topic is a post entirely different. Matter of fact I’ve written about the matter, so I’m done. Until next time. This entry was posted in scary fans and tagged B.A.P., bang yongguk, instagram, jieun, kpop, SECRET, yongguk. Dang it…..thanks for telling me! Now, I’m just going to sulk in the corner. But, he made a new one though. No wonder … i went on his instagram to check out if he posted anything new but nothing loaded so i waited like for a really long time until i gave up , i knew about the photo thing , i didnt know he deleted his acc OTL if fans keep this up soon , all the members will delete their acc ._. That is what I’m afraid of. I don’t know if these “fans” are harassing the other members (instagram or twitter) but hopefully they won’t take theirs down. I just don’t think celebrities would be affected that way to the extent of deleting their account because of silly fan comments – unless the comments are drastically horrible. I don’t think they were and I’m pretty sure they’re used to those kind of silliness by now. The photo posted of jieun doesn’t look legit – it’s a shot of her through a TV screen; it just doesn’t seem like something he would post up on ig. Anyone could have done that in their living rooms and post it up on his account to create controversy. It’s a pretty scary thing being hacked, not knowing what they might post up next to create more misunderstanding – if I were him in that scenario, I’d do the same thing. That’s interesting. I wouldn’t put it pass an immature fan (actually that would be considered a sasaeng fan.) Do you also think that the hacker made that “why so serious” comment? i think if his account get hacked and he should close his account, he would say that. Say something on his twitter like an apologize to the fans or explanation about being hacked. I personally think he has a soft heart and very sensitive, although he always smile like that. Maybe Some words made him so much hurt and he think he can’t take that anymore~~ that’s more make sense for me. Or he wants to protect someone that he loves (ji eun) hahahaha ‘My Wish’! !